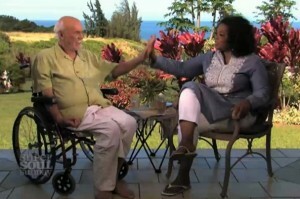 Ram Dass and Oprah Winfrey. Screenshot courtesy of OWN. The Oprah Winfrey Network invites social workers to watch the documentary “”Ram Dass: Fierce Grace” on Sunday at 11 a.m. Eastern during the network’s Super Soul Sunday programming. The documentary follows Ram Dass, a spiritual leader and best-selling author who has had to deal with aging and the effects of a stroke that paralyzed half his body. After the film airs Oprah Winfrey will interview Ram Dass at his home in Maui. For a sneak peek at the episode click here. Social workers often help the elderly and their caregivers cope with aging. To learn more visit the National Association of Social Workers’ “Help Starts Here” Seniors & Aging web site by clicking here.